Yu-u: Tsutomu, you've gone Ultraman-crazy. Tsutomu: You sound like my mom. Tsutomu: You don't like Ultraman? Lisa: The city's always being destroyed. I don't like violence. It's time to break out the rubber monster suits and go stomp on Tokyo! Eiji Tsuburaya's Ultraman series began in the mid 1960s, creating a huge franchise spawning numerous TV series, feature films and extensive merchandising. With Ultraman 80 completing production in 1981, after a 15 year hiatus during which both American and Australian versions were produced, a trio of Japanese TV series appeared in Ultraman Tiga (1996-97), Ultraman Dyna (1997-98) and Ultraman Gaia (1998-99), each set in their own alternate universe. This action adventure unites these heroes for the first time on the big screen. The Ultramen are giant robotic superheroes with human alter egos, who fight a barrage of evil alien adversaries, and protect their respective worlds. Their strength and abilities are truly staggering. Towering 50 meters tall, weighing 42,000 tons, they are able to travel at ultrasonic speeds, reaching over mach 25 in flight and up to mach 2 tunnelling underground. Their human counterparts maintain secret identities, but each is part of some task force. Gamu Takayama (Takeshi Yoshioka), a member of XIG (eXpanded Interceptive Guards), uses his Esplender to transform into Ultraman Gaia, and when we first see him, he is battling the hideous Satan Bizoh. We find out soon enough that we are watching him on TV, when Tsutomu's mother turns off his favorite program. The nine year-old boy's greatest dream would be to meet Gamu (Takeshi Yoshioka), and when he discovers a strange, glowing red ball that has the power to make wishes come true, he gets his chance. Pulled out of his home universe and across dimensional space, Gamu finds himself in a world where the children know his true identity. His arrival hasn't gone unnoticed, and when the school bully discovers Tsutomu's magic ball, he summons the meanest monster he can imagine: Satan Bizoh. Gamu transforms into Ultraman Gaia and wages a decisive victory, but in this world his strength does not last for long. As the authorities move in to surround his fighter craft, the forces of his home world pull him back across space and time, leaving Tsutomu and his friends to the evil intentions of the bully. The ball thrives on destruction, and as the negative forces being summoned increase its power, the ball begins to grow, generating ever more lethal monsters. Back in his home world, Gamu realizes what had happened to him, and decides to cross the dimensions to save the world from the darkness soon to be upon it, but one Ultraman alone is no match for the evil that is brewing. Of the two Ultraman films Image has released, this one is definitely aimed at a younger audience. While both have a decent amount of action and humor, the focus here is on the kids, and the fulfillment of their dreams, and the danger that ensues. The majority of the film features only Gamu and Gaia, but the climactic battle brings fellow Ultramen into the fray. The special effects blend classic minature model work and rubber suited monsters, with modern CGI, and while sometimes cheesy, has its own special charm, and is a fun, if less mature, adventure. The Japanese actors do a great job, but the same can't be said for the dead sounding dub cast. 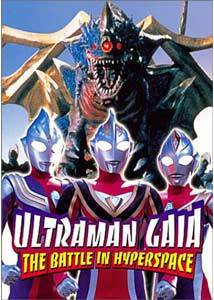 Since its original title, Urutoraman Teiga & Urutoraman Daina & Urutoraman Gaia: Choujikuu no daiketsugeki (literally Ultraman Tiga & Ultraman Dyna & Ultraman Gaia: The Great Decisive Attack of Super-Time & Space), is a bit of a mouthful, this release has been simplified to Ultraman Gaia: The Battle in Hyperspace. Image Transfer Review: The 1.85:1 anamorphic transfer is another great looking image. Print defects are negligible, detail is excellent, colors are bold and crisp, and black levels solid. A very filmlike appearance, with fine grain naturally rendered, with no sign of edge enhancement or aliasing. This looks super. Audio Transfer Review: Audio is available in either Japanese or English dub in 5.1 or 2.0 surround tracks. The Japanese 5.1 track is well defined with only slight amounts of edginess on the voices at times. Surround use is moderate, though effective. The English dub is horrid performance-wise, sucking any life out of the characters. Both 5.1 tracks have a more commanding bottom end, and much more enveloping audio, but otherwise is comparable to the 2.0 tracks. A 2.0 music only track is also available. Extras Review: Full motion menus feature music from the film. Extras include Japanese and English trailers for Ultraman Tiga & Ultraman Dyna: Warriors of the Star of Light (titled here as Ultraman Tiga & Ultraman Dyna: Warriors of the Lightning Star) and a Japanese trailer for Ultraman Gaia: The Battle for Hyperspace. Offering a fantastic adventure where the ultimate battle for the fate of the Earth is at hand, Ultraman Gaia: The Battle for Hyperspace is good, old-fashioned, Saturday morning fun. Plenty of action, monsters and cities being pummelled, as the forces of good and evil collide. Do yourself a favor and avoid the dub.